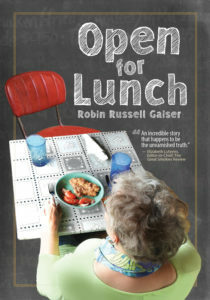 Malaprops Bookstore & Cafe, Friday, November 16 at 6 p.m.
Open for Lunch is much more than the heartwarming stories of Gaiser’s lunchtime encounters with perfect strangers. It is the intimate and unflinching account of her journey to self-discovery, release from heartbreak, and the grace that comes from forgiving others and yourself. [A]n artfully woven memoir… Throughout the telling of her inward journey are remarkable details that take the reader immediately to “place and circumstance.” The stories will also stay with the reader—from start to finish. [A]n amazing sto ry-teller. Open for Lunch sings, wails, flails and perseveres with integrity. Thank you, thank you! 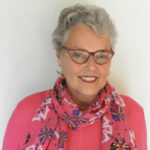 A former teacher and counselor, a singer and musician, Gaiser is a Certified Music Practitioner (CMP) who provides therapeutic music to the ill, the elderly, and the dying in hospital, nursing homes, and hospice settings. Her first book, Musical Morphine: Transforming Pain One Note at a Time, described her work in that field and was a finalist for the 2017 Best Book Awards in Alternative Medicine. Robin grew up the daughter of a trained classical musician and teacher, whose approach was literally by the book: study theory, follow the score, play in the key as written, avoid improvisation or experimentation. As a small child with perfect pitch and instant, complete recall, Robin played by ear what she heard in performance and improvised her own tunes. She started piano lessons with her mother, but that ended quickly when Robin continued ignoring the lesson book. Two years later, however, she persuaded her parents to enroll her in violin lessons and quickly learned to read music with her Italian teacher; within months she was invited to join the advanced orchestra, where she was soon first violin. Then, as a young teen during the heyday of ’60s folk music, she finally satisfied a long-growing curiosity about the guitar by borrowing one from a friend, learning basic chords, and then, with her scant savings, buying her first instrument for $25. A few months later she upgraded to her beloved nylon-stringed Goya, which she still owns and plays. Over the course of her life she performed in concert halls, on recordings (seven of which are in the Smithsonian’s collection), and live in small venues, and built careers as a high school teacher of English literature and composition and as a guidance counselor. Then Robin found a new niche, as a Certified Music Practitioner, or CMP. In that work she combines her love of acoustic music and talent on multiple instruments — guitar, violin, harp, Native American flute, among others, as well as her voice, which embraces not just singing lyrics but also chanting, toning, humming a cappella — with a guidance counselor’s insight and profound personal empathy, to help heal the spirits of those in critical care and in the final weeks, days, and moments of their lives. The work of a CMP is not that of a Music Therapist, nor is it what we think of as music “performance.” A CMP plays music in accordance with the patient’s needs: not to heal or cure, but to bring comfort and, perhaps, solace and joy. Gaiser listens, watches, picks up clues such as presence or absence of family pictures, jewelry (Star of David? Crucifix? Christian cross?) or imagery on the walls. She is alert to the breathing patterns and skin tone and other indications of the physical state of the patient. She notices what the visitors or family members gathered around are like — what they wear, their nervous tics, spoken or unstated denials or fears, and how they interact with the patient — and with her. 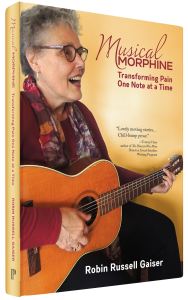 Musical Morphine: Transforming Pain One Note at a Time tells Robin’s story of her work as a CMP. Above all, she ensures that the instrument she chooses and the type of music she plays is what the patient needs, whether to ease pain, or ignite happy memories, or bring spiritual comfort, or, sometimes, ease the actual passage from life to death. Like all Pisgah Press books, it can be ordered through local bookstores or online at Amazon or Barnes & Noble.